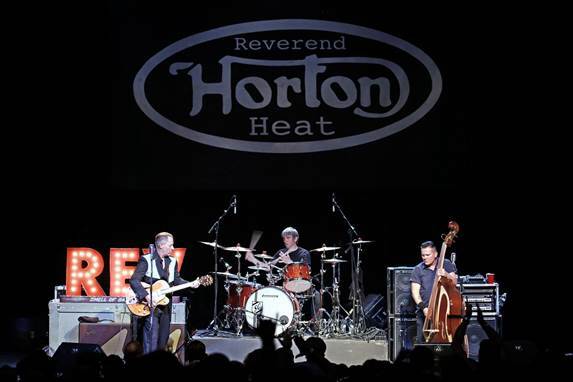 Rockabilly legends REVEREND HORTON HEAT are bringing their high-octane Rock & Roll to European audiences this summer. On Friday, July 3, the band sets things off with a performance at the 23rd annual Psychobilly Meeting in Pineda De Mar, Spain. Snaked between headlining performances and festival appearances, very few artists deliver a more blistering statement onstage than the mighty REVEREND HORTON HEAT. Mark your calendar, polish the Creepers, pomp the coif, bring the wife, bring the old man, and bring your thirst for fun because a dangerous cocktail of REVEREND HORTON HEAT is coming your way!